Caen, France – Roxanne Trunnell and Rebecca Hart brought FEI World Para-Dressage Championship competition at the 2014 Alltech FEI World Equestrian Games to a close with their Freestyle Tests. The La Prairie Racecourse hosted the final tests of the championships as the top third of competitors from Grade 1a, 1b, II, III, and IV looked to ascend the medal podium. Grade 1a rider Trunnell (Rowlett, Tx.) was making her final competitive appearance with Sidney Trunnell’s 19-year-old KWPN mare Nice Touch and made it a successful one as she closed out her World Championship debut with a seventh place finish. The longtime pair performed a forward, upbeat test set to French flared music to score 62.400% from the Ground Jury of Hanneke Gerritsen, Kjell Myhre, Marco Orsini, Eva Bachinger, and Sarah Leitch. Despite these Games being the final test for the pair, Trunnell has her sights firmly set on representing the United States at the 2016 Paralympic Games. Italy’s Sara Morganti and Royal Delight earned the Grade 1a Freestyle Gold medal with a score of 75.783%, with Laurentia Yen-Yi Tan and Ruben James 2 of Singapore clinching Silver on 74.522%, and Great Britain’s Sophie Christiansen and Janiero 4 earning Bronze with a score of 74.261%. Hart (Unionville, Pa.), a World Championship and Paralympic veteran, closed out her second World Games appearance with a seventh-place finish in the Grade II Freestyle riding her own Schroeters Romani. The 12-year-old Danish Warmblood mare earned a score of 65.400% from the Ground Jury of Freddy Leyman, Anne Prain, Hanneke Gerritsen, Kjell Myhre, and Marco Orsini after enthusiasm got the better of her in the Freestyle. Hart has enjoyed her time in France as well training camp in Aachen, Germany and getting the chance to get to know her teammates better. Rixt van der Horst and Uniek of The Netherlands won Grade II Freestyle Gold on a score of 76.350%, earning the Silver medal was Canada’s Lauren Barwick and Off to Paris on a score of 76.250%, with The Netherlands’ Demi Vermeulen and Vaness earning Bronze on a score of 71.900%. To learn more about the Para-Dressage Championship at the Alltech FEI World Equestrian Games, visit: http://www.normandy2014.com/2014-games/the-disciplines/8/para-dressage. Learn more about the Para-Equestrian Team: click here. Rebecca Hart and Schroeters Romani competing in Moorsele, Belgium. Photos by Photo Evenement. Wellington, FL – May 7, 2014 – Para-equestrian dressage rider Rebecca Hart just arrived home from European competition ready to kick into high gear for the June 2-5 USEF Para-Equestrian Dressage National Championships and selection trial for the 2014 Alltech FEI World Equestrian Games (WEG) in Normandy, France. 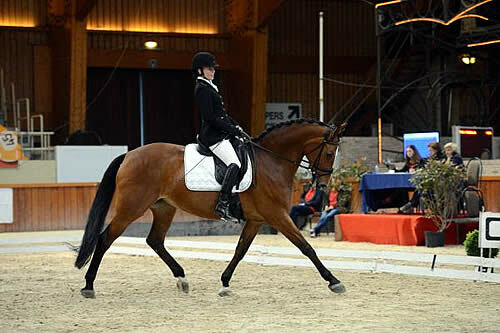 Hart and her equestrian partner, Schroeters Romani, a 12-year-old Danish Warmblood mare (Lobster-Manique, Come Back II), competed in CPEDI3* shows in Deauville, France, April 4-6, and Moorsele, Belgium, April 25-27, to gain valuable competition experience. Hart said Romani traveled like a pro and has taken all the changes in stride since the mare’s purchase in Denmark five months ago with the help of Hart’s supporters: Margaret Duprey and Cherry Knoll Farm, Hart’s family, William and Sandy Kimmel and Sycamore Station Equine Division. Duprey not only helped Hart with her dream to purchase Romani, but she also helped create the Jonathan Wentz Memorial Challenge for High Performance Para Dressage through the United States Equestrian Team (USET) Foundation. She and the Barnfield Foundation will match leadership gifts made to the USET Foundation for para-equestrians to compete in international competition including the World Equestrian Games and Paralympics to meet the $800,000 goal. “Hopefully, this challenge will raise the funds that will allow para-equestrian riders the chance to go to Europe and compete as Rebecca did,” Duprey said. Hart returned home to Unionville, PA, and continues her training with Missy Ransehousen, who traveled to Europe for six weeks to coach. Hart and Romani spent time in Florida to train and compete in the CPEDI3* in Wellington March 12-16, and while in Florida, she trained with Todd Flettrich. Hart said Romani has coped well with moving so often in the past several months. In France, the pair qualified for the freestyle with scores ranked in the top five in their division, Grade II. Then, in Belgium, they made the cut again. 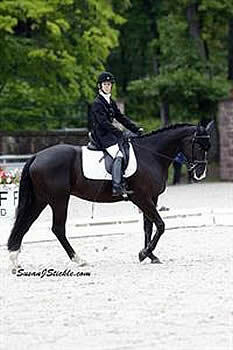 Hart will unveil a new freestyle in Gladstone created for the pair by Marlene Whitaker from Custom Freestyle. Hart said she plans to work on connection and artistic expression with her horse between now and the National Championship. For more information on the Jonathan Wentz Memorial Challenge, contact the USET Foundation, 908-234-1251. 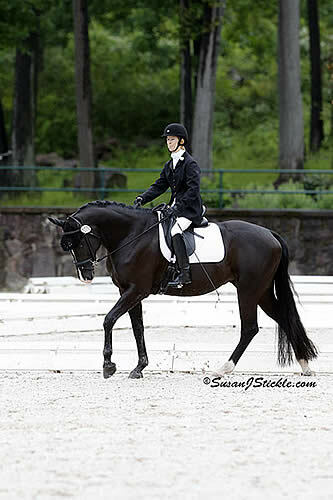 Rebecca Hart and Schroeters Romani at the Moorsele, Belgium CPEDI3*, April 25-27, 2014. Photo courtesy of Rebecca Hart. 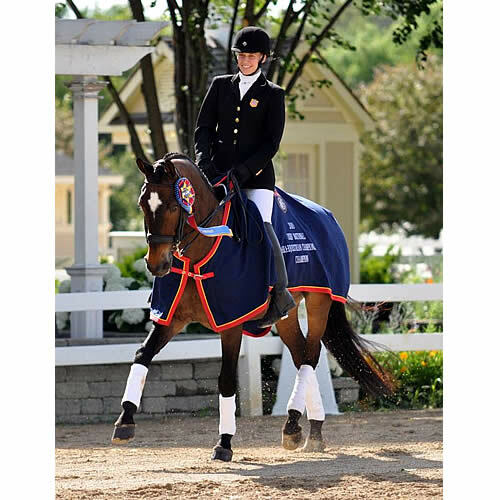 Unionville, PA – May 7, 2014 – It is imperative that international high-performance athletes competing for the U.S. travel overseas especially with the upcoming Alltech FEI World Equestrian Games™ (WEG) in Normandy, France. When para-dressage riders travel abroad with their horses they are able to compete in front of multiple FEI judges alongside their future competition. With the amount of riders that travel to the European CPEDI3* events, riders can get a good idea about where they stand, what they need to work on, and what their competitors are looking like. This feedback will help them on their road to the next international show. Although this is important, financially traveling overseas can be difficult in addition to the travel and scheduling commitment that it can take. This April 2014, three individual para-dressage riders took the opportunity to fly to France and Belgium during the multiple para-equestrian dressage CPEDI3* competitions. These riders all left just days after competing at the 2014 Adequan Global Dressage Festival CPEDI3* in Wellington, Florida. Athletes included two-time Paralympian Rebecca Hart (Grade II) and her horse Schroeters Romani; Margaret McIntosh (Grade Ia) and her own Rio Rio; and Mary Jordan (Grade IV) with Oldenburg gelding, Rubicon 75, owned by Vinceremos Therapeutic Riding Center of Loxahatchee, Florida, and formally owned and ridden by Catherine Haddad Staller of International Dressage. The competitions included Deauville, France, CPEDI3*, April 4-6, 2014, and the Moorsele, Belgium, CPEDI3*, April 25-27, 2014. These events were the final preparation before the 2014 USEF Para-Equestrian Dressage National Championship and Para-Dressage Selection Trials for the 2014 Alltech FEI World Equestrian Games™. The National Championship/Selection Trials will be held June 2-5, 2014, at the USET Foundation Headquarters in Gladstone, NJ. The United States Para-Equestrian Dressage athletes’ next stop will be the 2014 USEF Para-Equestrian Dressage National Championship and Para-Dressage Selection Trials for the 2014 Alltech FEI World Equestrian Games in August held in Normandy, France. The National Championship/Selection Trials will be held June 2-5, 2014, at the USET Foundation Headquarters in Gladstone, NJ. Full results may be found at http://www.quadrille.bz/2012/index.php/EN/results-2014. To view USA results from Deauville, France, CPEDI3*, April 4-6, 2014, go to http://uspea.org/april-8-2014-u-s-para-dressage-athletes-successful-overseas-at-cpedi3-in-deauville-france/. Rebecca Hart and Schroeters Romani. Wellington, FL – March 18, 2014 – Two-time Paralympian Rebecca Hart, a Grade II Para-Dressage athlete, and her own Schroeters Romani ended the CPEDI3* at the Adequan Global Dressage Festival with impressive results. The pair placed second in the FEI Para-Dressage Individual test with a 70.476 percent and second in the FEI Para-Dressage Freestyle with a 72.667 percent. 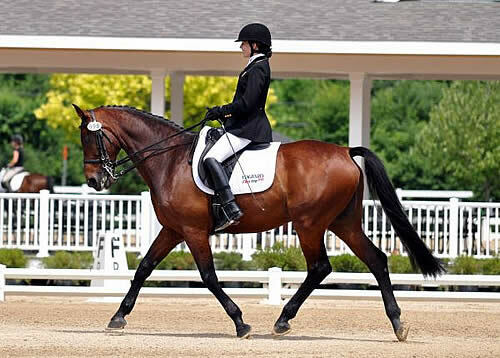 Schroeters Romani, a 12-year-old Danish Warmblood mare (Lobster-Manique, Come Back II), is a new ride for Hart after her 2012 USEF Para-Equestrian Dressage National Championship mount, Lord Ludger, was retired after the 2012 London Paralympic Games. Romani was purchased with the help of Margaret Duprey and Cherry Knoll Farm, Hart’s family, William and Sandy Kimmel and Sycamore Station Equine Division. Sunday’s freestyle, created by Marlene Whitaker from Custom Freestyle, featured trot music to “Classical Gas” and the walk tour is “For You, Matthew.” Hart said she worked on getting more impulsion in the walk as well as more connection and pizazz in her freestyle. The choreography, created for her former mount, Lord Ludger, included half-pass and shoulder-in for added interest and is being used until a new one is created for Hart and Romani. Romani and Rebecca Hart. Photo courtesy of Rebecca Hart. Wellington, FL – February 4, 2014 – Rebecca Hart, a two-time Para-Olympic athlete, has a new horse, thanks to a group of people who believe in her. Hart’s new horse, Romani, an 11-year-old Danish Warmblood mare, was purchased with the help of Margaret Duprey and Cherry Knoll Farm, Hart’s family, William and Sandy Kimmel and Sycamore Station Equine Division. She hails from Unionville, PA, and trains with Missy and Jessica Ransehousen. 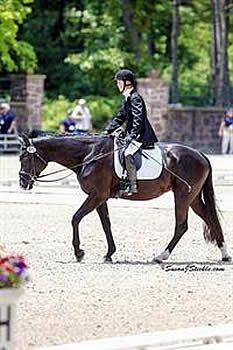 In 2012, she won the USEF Para-Equestrian Dressage National Championship title aboard Lord Ludger. Her former mount, owned by the Ransehousens, was retired to a life of eating grass, hacking and light riding at the age of 21 after the 2012 London Olympic Games. 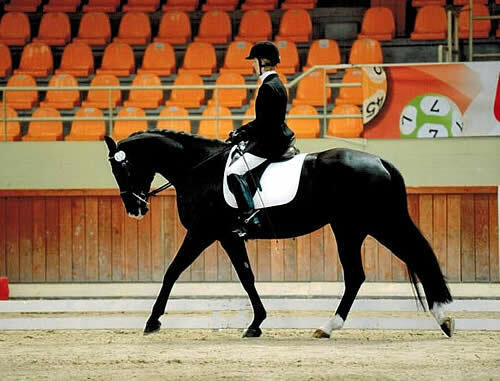 Hart and Lord Ludger placed just out of the medals at the both the 2008 and the 2012 Para-Olympic Games and she hopes Romani is the key to future success. 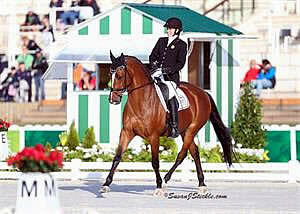 The pair will arrive in Wellington in February and will be based out of Duprey’s Cherry Knoll Farm. They will compete in the Adequan Global Dressage Festival 10 CPEDI3* Para-Equestrian Dressage show in Wellington in March and then fly out of Miami for CPEDI3* competitions in Belgium and France. Hart plans to qualify for the June 2014 Para-Equestrian National Championship and Selection Trials in Gladstone, NJ, with the ultimate goal of participating in the 2014 Alltech FEI World Equestrian Games in Normandy, France. Beyond that, she wants to go for the gold at the 2016 Olympic Games in Rio de Janeiro, Brazil. Hart thinks Romani could be the perfect partner. She said the 16.2 hand mare arrived from Denmark at the end of November and is athletic, supple and fun to ride. She had a comfortable connection with the horse the first time she rode her. She said that when she mounted Romani in Denmark, it was the first time in 18 years of riding that sitting in the saddle did not hurt her hip. Hart has birth-onset hereditary spastic paraplegia, a degenerative disease that causes muscle wasting and paralysis, and credits riding with her continued mobility and ability to walk. She said that the more people understand para-equestrian riding, the better it will be for the sport. Hart added that she’s thankful for her support team who has recognized that she competes in a legitimate high-performance sport. New York, NY – October 10, 2012 – On Wednesday October 10th, U.S. Paralympian Rebecca Hart of Unionville, Penn. was showcased on ABC’s Good Morning America. Hart and horse Lord Ludger accompanied Ann Romney, wife of Republican presidential hopeful Mitt Romney, in New York’s Times Square. Mrs. Romney and Rebecca Hart spoke about how horses have provided a unique form of therapy for each of them. Mrs. Romney co-hosted the news hour with George Stephanopoulos where she was filling in for Robin Roberts, who is on extended medical leave. Rebecca Hart and horse Lord Ludger (owned by Jessica Ransehousen) presented a previously recorded segment from October 8th showcasing the Paralympic Dressage duo at Blue Hill Farm. The previously recorded segment featured Rebecca Hart explaining how equine therapy has improved her quality of life and how it has helped her work through Familial Spastic Paraplegia. Mrs. Romney, who was diagnosed with Multiple Sclerosis in 1998, began riding as a form of therapy and found equine therapy to benefit her life in many ways as well.